Duangkamol casts a spell of antique elegance with the design of this vase. 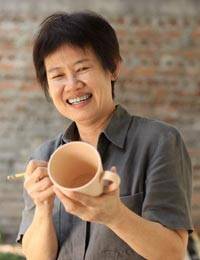 She crafts the ceramic vase by hand, featuring roses blossoming over turquoise with brown borders. 27.5 cm H x 13 cm Diam.